I traveled in April with Natalia Gajdamaschko from Vienna to Ukraine by train. The itinerary took us to Budapest where we boarded another train to Záhony, a small Hungarian border town. There, we got into a small antique train that carried us a few kilometers to Chop, Ukraine’s border town. 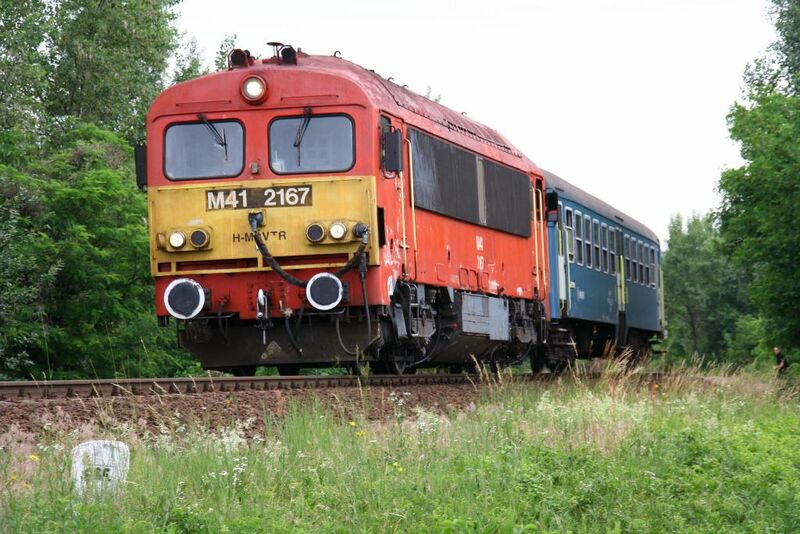 Changing trains in Záhony is required because the train tracks in countries of the former Soviet Union are wide gauge while the train tracks in Europe are narrow gauge. (Gauge is the distance between the two parallel rails of a railroad track.) 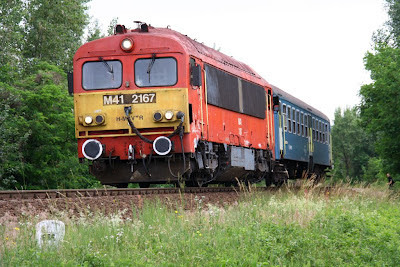 Because track gauges differ, European trains cannot use the train tracks in the former Soviet Union and Ukrainian trains cannot run on European tracks. The explanation for the different gauges is, I have been told, that Stalin did not want railroads used for attacks from Europe or escapes from the Soviet Union. Aside from some anxiety about changing trains in Záhony, the passage into Ukraine went smoothly, if not entirely comfortably. Fortunately, travel into Ukraine has improved greatly since the 1990s when I often traveled there, sometimes in a vehicle and sometimes on a train. I made many trips to Uzhgorod via Chop as part of a project that the University of Georgia had with Uzhgorod State University, and each border crossing was attended by some anxiety. Hungary and Ukraine. The border station lies at the end of the bridge. In those years, crossing the Hungarian-Ukrainian border was a chaotic and often unnerving experience. Independent Ukraine had only recently been created, and border officials had been trained to serve the Soviet Union, which meant that they suspected most foreigners entering the country were, at best, smugglers and at worst were spies. Also, the border was very busy. Huge numbers of Ukrainians were traveling into Hungary and Slovakia, and many were smuggling something. They did so to survive horrible economic conditions. The Ukrainian economy collapsed in the early 1990s and the country robbed most people of their wealth through the sharp devaluation of its currency. Many Ukrainians found they could make money by selling cheap Ukrainian goods such as cigarettes and liquor in Hungary and scarce Western goods in Ukraine. Heavy border traffic offered opportunities for border officials, even border guards, to make some much needed money. For a small payment, a car or small bus could quickly bypass the long line of vehicles waiting for their turn at the border. Also, for a few dollars or hryvnia, customs officials might overlook the extra bags, stuffed with things to be sold, a person was bringing into the country. 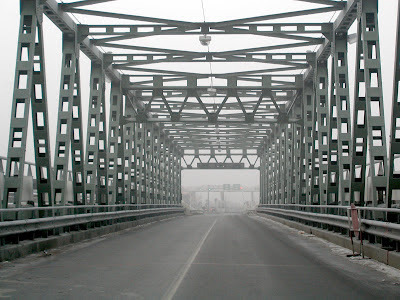 The unnerving part of a vehicle crossing into Ukraine in those years was the uncertainty of what was happening. The crossings were often at night, and the dimly lit border stations were dominated by scowling men in strange uniforms. One of them would take away your passport as you sat in silence imagining everything that could go wrong. After an unexpectedly long time, someone would return with the passport, and the car would drive a few feet forward to encounter another uniformed official who would make the driver open the trunk. After some tense conversation with the driver, the customs officer -- with a skeptical look on his face -- would wave on the vehicle. Then passing through a couple of checkpoints manned by young soldiers with rifles, you were relieved to leave the border. In comparison to crossing the border by vehicle, entering Ukraine by train was more pleasant and less threatening. When you arrived at the Chop station, you joined the rush of people to go through passport control and customs. The first time you did this, you likely ended up at the back of the line because experienced travelers would spring from the train and sprint to the station. Nevertheless, despite the time it took to get through the border checks, entering the country by train seemed much more civilized than by car. 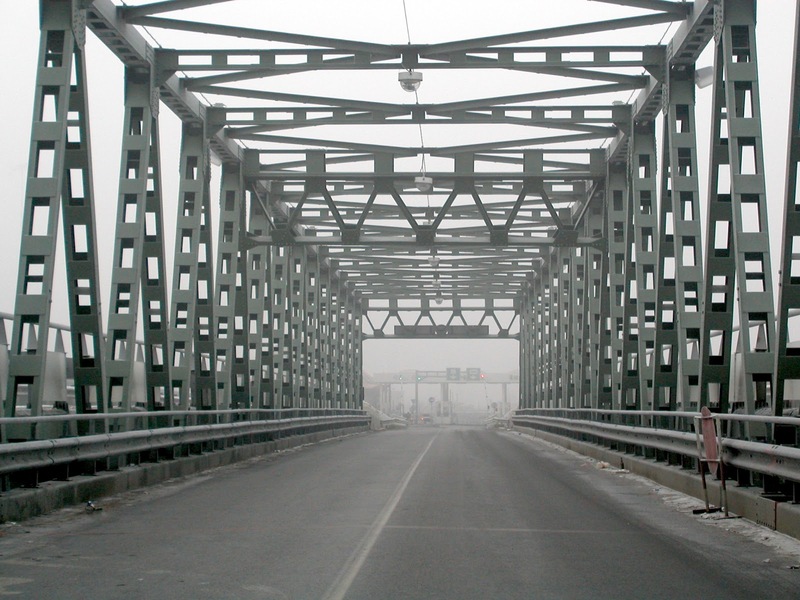 Crossing into Ukraine is now much more coherent and less threatening. One reason for this is that fewer Ukrainians now travel regularly to Hungary, so fewer are returning either on the roads or trains. The smaller number of travelers is a result of Hungary joining the European Union. Ukrainians now need visas to enter Hungary, and the visas are not only expensive but difficult to get. The EU guards against Ukrainians who try to enter Hungary to work there or travel to other EU countries to search for work. Also, fewer Ukrainians travel to Hungary to sell and buy good. The black market is no longer thriving. Fewer Ukrainian goods can be sold abroad because they are no longer a bargain. Also, most Western good available in Hungary can also be purchased in Ukrainian stores, if you can afford them. The improved border crossing will be welcome by visitors flocking to Ukraine in June to attend Euro Cup soccer matches. The country is co-hosting with Poland the 2012 UEFA European Football Championship. This wildly popular quadrennial event will attract soccer fans from all over Europe. Those visitors will find that Ukraine is still a poor country with inadequate public services. Nevertheless, visitors can expect that Ukrainians will make them feel welcome. Visitors who take the time to see the historical and scenic treasures of the country will be impressed. When traveling between Hungary and Ukraine by train, visitors will pass through the Chop, as we did in April. There, they will find a train station that looks now much as it did in the 1990s and probably much earlier. It has the design and feel of a Soviet train station. It is cavernous, dark, and unadorned except for a large mural along its interior walls. This huge mural is a relic of the Soviet Union, depicting its history from the revolution to the years before the dissolution of the empire. When looking at the mural, one of the few pieces of Soviet propaganda still visible to the public in this part of Ukraine, you can see “socialist realism” art depicting Soviet history as a story of the triumph of workers and a happy march into the future. Viewing the mural, I sometimes wonder what an extension of it would look like: how would the last twenty years of Ukraine be depicted in art form? Just as it is difficult to find remnants of the Berlin Wall when visiting that city, it now difficult to find examples of Soviet public art and propaganda on display. Most statues of Lenin have been removed from public spaces. The hammer and cycle insignia has been chiseled from walls and fences. Communist Party slogans have been painted over. Thus, we can get a glimpse into this important element of Ukraine’s past only in places like the Chop train station. 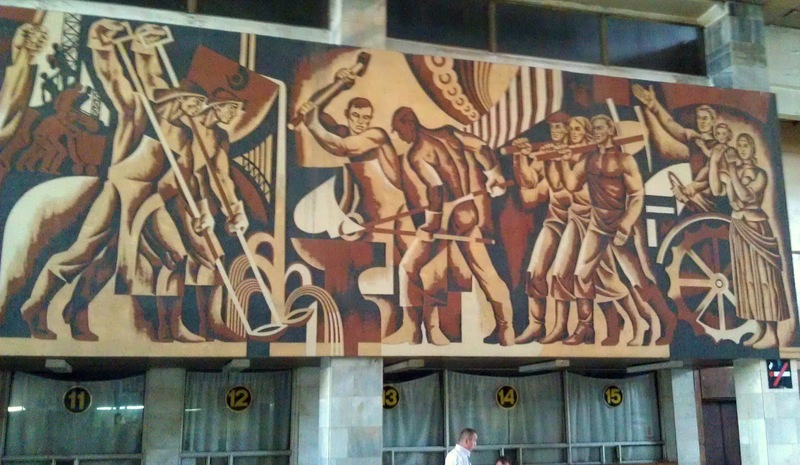 If you find yourself in the station, it is worth a few moments to step back in history by looking closely at the mural to see what the citizens of Soviet Union saw when they came to this train station during the last years of the empire. Mural 3 especially took my breath away. Truly an incredible work of art. Thanks for pointing out that sad fact and posting the picture. I was there in early April to get a train to Budapest and was shocked to see the murals were no longer there. I had told some friends traveling with me about the murals and they were interested in seeing them. So we were disappointed by their absence. Too bad the paintings are gone! I wonder what happened. They are not destroyed (yet? ), only covered, as a result of the decommunization laws of 2015.